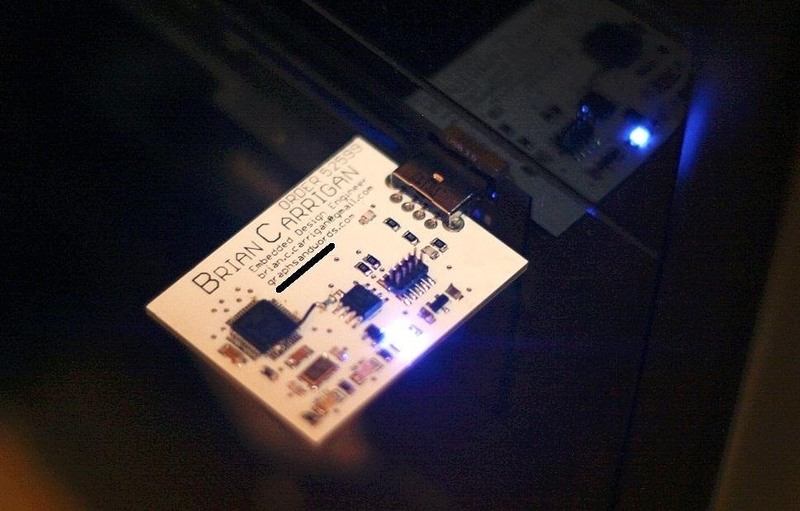 Whether you're job searching, networking, or just giving your information out to someone you just met at a bar, this circuit board business card made by Brian Carrigan will make sure no one ever forgets meeting you! Sure, you could buy a customized USB business card on some online shop, but if you're trying to emphasize your geek cred, why wouldn't you make your own PCB card from scratch? Carrigan used a USB controller and added an Atmel AT45DB series flash chip so that it could store his resume, a link to his site, and the source code for the project itself. An LED light tells you when it's connected and whether it's reading or writing, and the circuit board has his name and contact information silkscreened on the front. Brian posted the schematics and code on his blog, so you can find out more about how he did it if you'd like to make your own. If you're not feeling up to designing a circuit board, you can also design an animated business card in Flash, or try these eco-friendly cards that are embedded with seeds. What are some of your ideas for creating memorable business cards?